The Onion Stand: Tweetylicious - a Twitter-like microblogging app in just one file! Tweetylicious - a Twitter-like microblogging app in just one file! 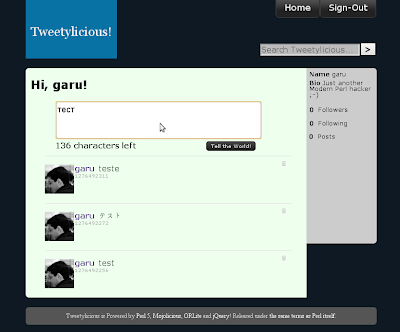 Tweetylicious is a small - but rather complete - microblogging web application in a single file! It is meant to demonstrate how easy and fun it is to create your own Web applications using modern Perl 5 and jQuery! You'll need Mojolicious and ORLite - two very lightweight modules - to run the app, and that's about it! A live Internet connection is also good, since it fetches jQuery on the fly. Well, that's it. Have fun! if you hurry, you can see it in action here. Well, it's a single file application only in the sense that you don't count all of the other files it requires as dependencies. That is, it's not a stand-alone application as you imply. @brian: If by "all of the other files it requires as dependencies" you mean Mojolicious, ORLite and jQuery, I did mention them. Sure enough, they also depend on other modules (and files), but fortunately they're all core, and bundled with perl. If you want to be thorough, perl itself is a dependency too, and you won't be able to take much advantage of it without a web browser client either. It *is* a single file application in the sense that the app itself is in tweetylicious.pl and nowhere else, so hopefully a beginner will be able to look at the app and not only understand what does what, but easily tweak things as he/she feels necessary - I did mention it is a demo, didn't I? - It's also pretty small without actually making any effort in so, which again is to show how much a beginner can achieve with Perl even using minimalistic frameworks such as Mojolicious::Lite and ORLite. I'm sorry if it wasn't clear enough. Not only I'm not dismissing dependencies, I couldn't have done it like so without them. My point was the little dependencies Tweetylicious has are very lightweight and, as such, it should be very easy to install, run and fiddle with. I thought that your use of source control is a *really* cool way to do a tutorial. That would be an AWESOME way to show people how to develop really any kind of application or module. I hope to do something similar at some point. Thanks for the inspiration! @fREW: Thanks! Actually, I got that idea from the Cat Book, which presents code change in a diff-like format and lets you download the resulting repository. Excellent post, $full_examples_as_tutorials++, the git diffs are nice. I've learned last years CGI, Catalyst and Dancer, this post (and the websocket support seen in other examples) is encouraging me, to learn mojolicious too. If people are interested, I might put it in CPAN after a couple updates, in which case it will include standard Makefile.PL and all that (which would in turn make it even easier to install using things like miyagawa's cpanm). Check out the documentation for Mojolicious::Lite. It should have everything you need. You can also reach #mojo in irc.perl.org or the mailing list if you need help! It is faster than the original Twitter written on Ruby. Tue Jun 22 16:20:06 2010 debug Mojolicious::Plugin::EpRenderer:38 : Caching template "/usr/home/as/prg/perl/mojo/mojo/tweetylicious/templates/index.html.ep" with stash "callback, content, rendered, started". Tue Jun 22 16:20:06 2010 debug Mojolicious::Plugin::EpRenderer:38 : Caching template "/usr/home/as/prg/perl/mojo/mojo/tweetylicious/templates/layouts/main.html.ep" with stash "callback, content, rendered, started". String found where operator expected at (eval 292) line 15, near "session 'name'"
String found where operator expected at (eval 292) line 16, near "session 'name'"
Tue Jun 22 16:20:06 2010 error Mojolicious::Plugin::EplRenderer:84 : Template error in "layouts/main.html.ep": Error around line 15. But /static.css and /static.js served OK.
Не работает. Хотя статику (стили и скрипты) успешно выдаёт. @Shoorick: that's very odd. Can you please make sure you have the latest CPAN version of Mojolicious? The username and bio display chinese as alien chars. Then non latin chars display normal in everywhere. This is a good mojo example. could federation be plugged into it? eg ostatus, dfrn or any other suitable protocol? would love to see something like Friendica or StatusNet for perl!